The original two-story home was built in 1979 and was about 2,000 SF. The scope of work for this renovation included a 1500 SF addition and remodeling the entire house, especially the small master bedroom and the crowded, dark kitchen. The existing two-car garage was converted into a craft room and a new 900 SF garage with workshop and elevator was added to the first floor in addition to a large laundry room and a new guest bathroom. The second story of the addition included a huge master bath, master closet, and bonus room / office. The kitchen was opened up completely and now features an over-sized walk-in pantry, a large island, and a garden window over the kitchen sink. Renovation of the exterior included replacing the siding and trim and replacing the wooden bridge leading to the front door. 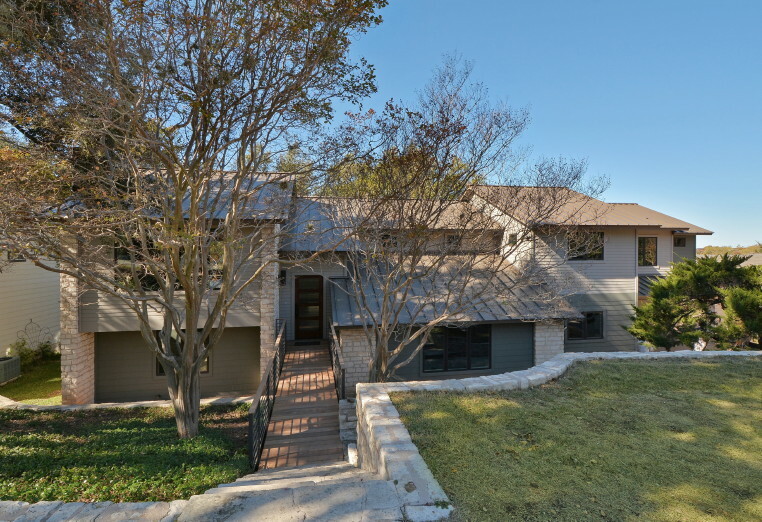 Contemporary handrails were designed for the stairs, bridge, and new decks along the back of the home, which have stunning hill country views.